Who do you guys think will win? Matt Hall or Mika Brageot? Good Morning RBAR Family! I'm finally here at the track! I missed the Challenger Cup Race! 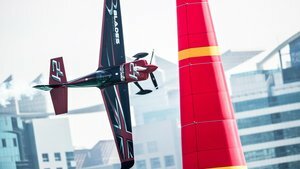 Did Challenger17 win the Abu Dhabi Race? I'm predicting that FLV12, BM24, MB11 and MHR95 will advance to the Final 4 Round! Can I stream this to chromecast? Good luck Matt, we all believe back here. And the Round of 8 is on! Mikey G into the track, he knows that Matt Hall can perform under pressure and go fast, so it's got to be a clean but full throttle run today. Good Luck Matt. You can do this. Goulian in at 198kts and he's got a great start, consistent and very clean lines, but he's got to push really hard through those gates to get a spot in the Final 4. No over-Gs, he's through Gate 6 with no penalties and he'll be going for a sub-54 time here. Nicely executed Mikey G, 54.300. That's a respectable time, but Hall has gone faster. Hall just needs to avoid those penalties that have dogged him this week. Hall into the track at 199.9kts. He'll know he can go faster than Goulian, but the splits are in the red so far. Hall has got a lot of work to do here, he's 0.213 behind Goulian and he's losing time in the second part of the track. There seems to be a lack of energy in his performance, is he holding back? The splits are STILL in the red and Hall is trailing as he takes it through the Finish Gate. That's a few points in the bag for Hall in the World Championship standings but no place in the Final 4. Goulian progresses. Goulian and Sonka have progressed... four pilots still to fly, only two places remaining in today's final. Brageot went 54.865 in Qualifying, and Chambliss has got some serious speed. Brageot looking slightly scrappy, a little correction there and he's picked up +2seconds at Gate 7 for incorrect level flying. Former Red Arrows pilot Ben Murphy next up in Heat 11 as he takes on Muroya for the last spot in the Final 4. There's only 2 pilots left. Who could they be? Good time Ben. Better than some of the older Master Class pilots.